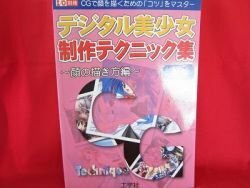 Title : How to Draw Manga (Anime) book / Drawing girl's face by using PC Language : Japanese. This is an official book. Release Date : 2001 Total Pages : 245 pages Condition : USED, Very Good, No missing page. This is a Japanese How to draw Manga (Anime) Book. This book is a reference book to explain the writing of the Japanese Anime & Japanese Manga. You can learn a lot because there are a lot of illustrations of this book. If you want to draw MANGA of Japan, this book will become a wonderful book for you. Even if you can not read Japanese, you will be able surely to learn it! !